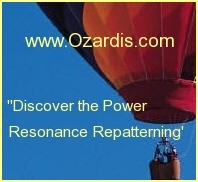 How did you first learn about Resonance Repatterning? A friend introduced me to a practitioner who did body scans. The scan validated the stress in my body as we explored the emotions held in the organs, and a light bulb went off in terms of my childhood traumas. She suggested a Resonance Repatterning session to identify negative thought patterns and beliefs that I was still resonating with. I began the session from a negative space and at the end I felt like wonder woman! I was ready to tackle the world. I felt so completely different each time I received a session that I decided to learn how to do this myself.